Provide partygoers of all ages with over 38’ of fun and action with one of our Obstacle Course party inflatables! 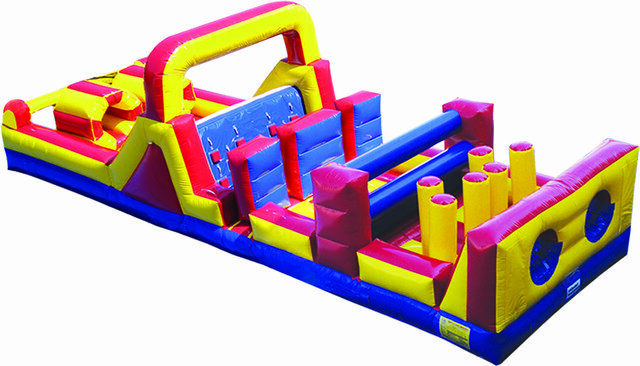 This massive inflatable features a variety of challenges and obstacles for participants to run, jump, and climb across, including a wall they need to scale, obstacles that forces them to squeeze through a small opening, and more! All of our inflatables are fully inspected and clean in between rentals, and with Waco Bounce House Rentals, you get guaranteed on-time delivery with every order! Add the excitement of our Obstacle Course to your next party or event and make your reservation today! Minimum Participant's Height - 42"
Maximum Jumper Weight - 250 lbs.